13 - 16 Apr 2017 Parisilk: Big Warehouse Sale with Deals on Home Appliances & Electronics from Bosch, Brandt, Fisher & Paykel & More! Parisilk's big warehouse sale starts today! Grab bargains on home appliances and electronics products from Bosch, Brandt, Fisher & Paykel, Samsung, Sharp, Panasonic and more from now till 16 April 2017! THE SALE YOU CANNOT MISS! 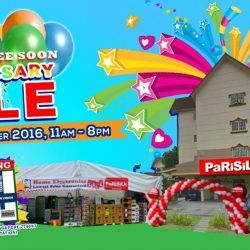 Get showroom sets up to 90% OFF at PaRiSiLk Anniversary Sale from now till 9 October! Washer starts from $189 and fridge starts from $289. Brands on SALE include Samsung, LG, Panasonic, Karcher, Philips, Kuvings, KDK and many many more…Full Range of AV, IT and Home Appliances and FREE PARKING!